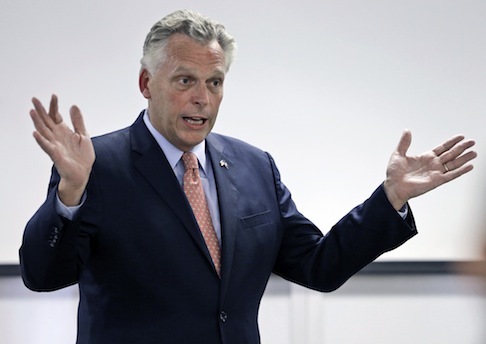 New emails provide more evidence that Terry McAuliffe, Virginia’s Democratic candidate for governor, urged Homeland Security officials to grant visas for his failed auto company’s foreign investors. The emails obtained by Watchdog.org document McAuliffe’s exchanges with Noah Kroloff, then-chief of staff for the Secretary of Homeland Security Janet Napolitano. The emails came in a string beginning with McAuliffe, then chairman of GreenTech, and DHS Secretary Janet Napolitano’s chief of staff, Noah Kroloff, on Nov. 16, 2012. The subject line: "Further to our conversation today re USCIS (U.S. Citizenship and Immigration Services) and GreenTech Automotive." The emails were obtained from USCIS through the Freedom of Information Act. The agency refused to provide notes of telephone conversations referenced in the emails. In one email, McAuliffe thanked Kroloff "for taking the time to discuss our concerns regarding the timeliness of USCIS’ review of our investors’ EB-5 petitions." McAuliffe’s company has been under investigation by the Securities and Exchange Committee for an alleged visa-for-sale scheme since May. This entry was posted in Politics and tagged Governor, GreenTech, Terry McAuliffe, Virginia. Bookmark the permalink.